Why Morocco ruined my love for Moroccan food! 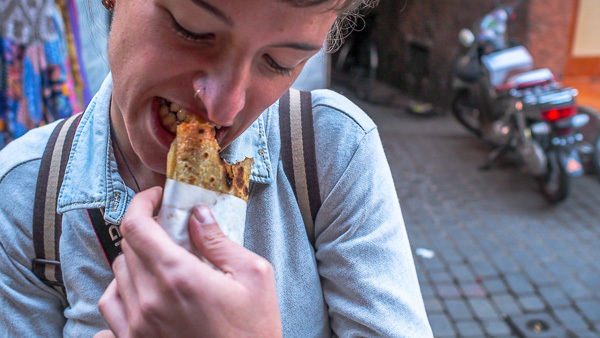 As budget-minded backpackers, we were excited at the prospect of tasty Moroccan food at low-low prices. In reality, we only got that in the touristy areas and at a price. When we ventured out of the tourist areas, we got the low-low prices, but the food was very short of amazing. Marrakesh had all the amazing Moroccan food we could ever want! In the tourist mecca of Marrakesh, we found all sorts of gastronomical goodies that made us initially love Moroccan food. 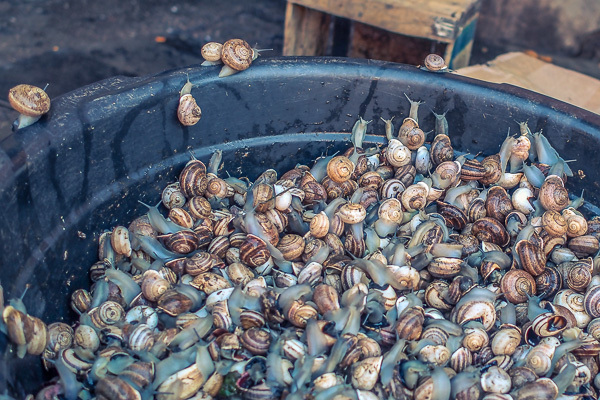 Buckets of slimy snails inching around and finding them later that night to swallow them like a ball of snot. Deep-fried gooey eggplant and sardine sandwiches that were out of this world. Couscous that looked like a fresh pile of fluffy snow. Melt-in-your-mouth meat revealed from underneath a smouldering tagine. Topped off with too many teeth-rotting sweet teas to count. As I said, though, this all came at a price. In the big city markets, a normal meal will cost you around $7 US for the main course, just like in Europe. With that, our first prospect for Morocco was dashed. No cheap, amazing food. Our food journey hit a second speed bump. We left Marrakesh and went to the more rural South hoping we could still find that illusive cheap and good meal. However, all we found could be compared to a child star’s career. The glitz and glamour were quickly gone and we were left with a weird version of something that was previously amazing. This became especially evident during our time in Tioughza and Tagounite. Those gastronomical goodies we fell in love with in Marrakesh were no more. The eggplant and sardine sandwiches became oil and honey sandwiches. The couscous turned into mushy rice and yoghurt. Worst of all, the melt-in-your-mouth tagine disappeared and became chicken bones and overcooked carrots. All brought together with bucket loads of bread at every meal. Thus, the reality of our Moroccan food adventure outside of the tourist hubs was somewhat dull and monotonous. Now you might think to yourself “yeah yeah, but at least the street food is always pretty nice”. That is indeed the case in many lovely places around the globe, but sadly Morocco is just not one of them. Yes, it was cheap, but in our travels, we are used to street food being as good, if not better, as what restaurants dish out. Where did all the spice go? Morocco is no exception to other cheap countries where people don’t have much money in rural areas. This low level of income together with the compounding effect of an arid climate just makes cooking tasty, varied food difficult. We’d heard from a few places that most people get sick of Moroccan food after about a month. After those first few days walking the alleyways of Marrakesh we remembered that and laughed. In the end, the prophecy ended up coming true; after spending one month in Morocco’s rural South we were well over it. As in, I-physically-cannot-eat-one-more-tagine over it. When I was young I used to run all over the old town with friends, so now, when I go back to Morocco, I can find tiny shops or restaurants with only 2 or 3 tables where you will have delicious gastronomic homemade meals. But this will be in some tiny unknown streets where tourists never go . About street food, I’ve been in India, Turkey and South America (Argentina, Chile, Uruguay), you have to look where most of locals are standing out of the shop, this is where food is good. another tip is to go eating in local markets. About fake nice guys, I’m lucky because I can speak a little bit of Arabic, so they don’t bother me. A good thing is learning a few words wherever you’re travelling and knowing how to count to ten and how to say “hundred”. I’m going to Iran soon and I have to thank you for very helpful tips in your blog.